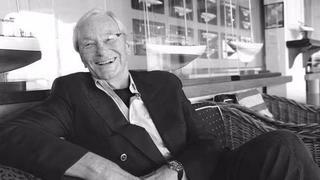 Tom Perkins, the venture capitalist and boundary-pushing superyacht owner, has died in California aged 84. Perkins co-founded Kleiner Perkins Caufield & Byers in the early 1970s, before venture capitalism was an established practice. He also helped to launch the computer division of Hewlett-Packard and invested heavily in the nascent Silicon Valley, making him a founding father of the digital age. Perkins was equally innovative in his yachting endeavours and is best known in nautical circles for his avant-garde three-master, Maltese Falcon. His sailing career continued later in life with his first sailing boat Teak Lady, a Cheoy Lee, then a 1936 International One Design, both of which he raced with his late wife Gerd. The couple turned to offshore competition with the Philip Rhodes yawl, Copperhead, before Perkins took his requirements to Italy, where he had heard a yard was making automated sailing yachts. That was 43 metre, 1987 ketch Andromeda la Dea (now Paz) Perini’s second ever yacht. A 47 metre Andromeda la Dea followed, then 33.5 metre classic Herreshoff Mariette, and Perkins became a successful competitor on the Classics racing scene. But for his most ambitious boat yet, Perkins returned to Perini Navi. Perkins wanted a square-rigged yacht suitable for ocean crossing and trade winds. The unusual Dynarig set up fitted the bill and he engaged Dykstra to develop it for a yacht, with Ken Freivokh responsible for exterior and interior design. The result, 88 metre Maltese Falcon, was a boat stunningly innovative in both her appearance and technical detail. Gerard Dijkstra has led the tributes for Tom calling him a "visionary man". "The time during which Maltese Falcon was built has been one of the best of my live," he added. "It was a pleasure working for Tom. It was his common sense, his risk assessment, his seamanship and his feeling for technical matters which kept us on track and which put a sound foundation under what could easily have developed into a pipe dream. It is seldom that one gets the chance to work on such an innovative project and in such good harmony. Tom thank you for your trust in our office. May I quote you, 'in hindsight we can say that we were brave and not just stupid'." Always seeking a fresh challenge, he sold Maltese Falcon after three years of happy sailing and pursued a new interest — submarines. He bought a Super Falcon, capable of diving to 400 metres, and converted a 37 metre Japansese fisheries vessel into the superyacht Dr. No, embarking on various South Pacific expeditions. Tom Perkins’ fearless determination to strive for innovation will be missed by the superyacht industry as a whole. You believed in us, just as we were setting sail in 1987. You bore our standard again in the 1990’s, circumnavigating with your second Andromeda La Dea, but your third yacht established an icon which will not be surpassed. I will treasure the countless hours of mental sparring in which we indulged, culminating - after so many years - in your yachting masterpiece, the Maltese Falcon. Your foresight and determination gave us all the chance to create her – and I can never thank you enough.